The Saco Bay, ME connected the two rivers. This coastal region is frequently flooded during nor’easter events. 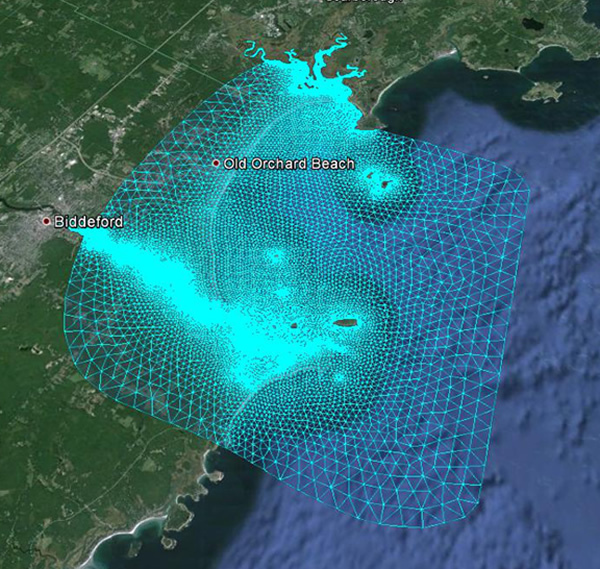 The Saco Bay inundation FVCOM domain is configured with sub-regional unstructured grid with a horizontal resolution varying from ~ 400-500 m over the shelf to ~ 10 m inside the harbor. In the vertical, a total of 10 uniform σ-layers were specified, with a vertical resolution varying from 1.5 m over the shelf to 0.1 m or less along the coast where the water depth is 1 m or shallower. The Saco inundation FVCOM is driven through a one-way nesting to GOM-FVCOM and FVCOM-SWAVE with inclusion of wave-current interactions. The model is under the testing and validation status, and will be placed into the forecast operation after the validation experiments are completed.